I can't believe it's already 2013, but that means it's time for my annual book round-up! GRAND TOTAL = 99 books. This was a real year of historical romance, apparently. Over half the books in that category! And compared to last year's number (143), it's a clear drop. Not so surprising though, since I started my Master's program in September. With full-time school in 2013, I wonder if I'll see an even greater drop. Hm. . . .
- The Lords of Deliverance Series by Larissa Ione - Four books so far in this paranormal romance series about the Four Horsemen of the Apocalypse. Lots of damage that needs to be healed in heroes and heroines, lots of tension of all sorts, and such a neat supernatural world. Also cameos from characters in her other series! - The Urban Food Revolution: Changing the Way We Feed Cities by Peter Ladner - I read it for a paper on bringing the urban to the rural, but it made me entirely excited. This is what we should be doing to become empowered, and take charge of our own food! Things like: community gardens, farmers markets, fresh food initiatives at schools, farm shares. . .
- Cloudy with a Chance of Marriage by Kieran Kramer - This is #2 in her "Impossible Bachelors" series of historical romances, though I totally adored this one. It's about a woman trying to run a bookstore and at the same time develop her neighbourhood, when a pesky naval captain just returned from years of service decides to open up his own home to "relaxation". Light-hearted, yes, but the characters were so delightful! - Damned Nations: Greed, Guns, Armies, & Aid by Samantha Nutt - What a "wow" book. Written by one of the founders of War Child, it's about her own experiences in developing countries (mostly African), as well as an overview of how aid, and more, can damage. Definitely a personal opinion sort of book, but I really respected the cynical-but-hopeful sort of attitude she gives. Recommended to anyone considering doing international volunteering/aid work. - The Wallflowers series by Lisa Kleypas - A Regency romance series that is likely familiar to many Regency readers (but hey, it was the first time I've read them!). So pleasing with the four very different wallflowers who decide to take action and get something better. It doesn't always turn out the way they want, but the tension and romances are great in these. - Quiet: The Power of Introverts in a World That Can't Stop Talking by Susan Cain - Such an interesting non-fic, and so necessary. There are a lot of things I "prefer" that I thought were a bit outside of the norm - turns out that no, I'm just an introvert, like PLENTY of other people. Good smatterings of science and personal stories combined make this a really enjoyable read as well. - The Pink Carnation series by Lauren Willig - This is an interesting mashup of Regency-era spies (not usually my thing) with romance and a modern-day chick-litty heroine doing research on them (REALLY not usually) my thing). And it ends up really working, even for me! I like the modern heroine because of her drive to research (and can sympathize with her grad student life), and the historical romance/spy pieces are well-researched, well-written, and with often quirky, different sorts of characters. I'm a heavy-duty tea drinker, and ever since my sister started working in the head office of Steeped Tea, I've dreamt of having a tea party of my own. Steeped is a home party business here in Canada that's all about loose-leaf tea, tea products, and other goodies. When I added "Host a Steeped Tea Party" to my 30 Before 30 list, I was thinking of doing just that. But then, I decided to take it a bit further. 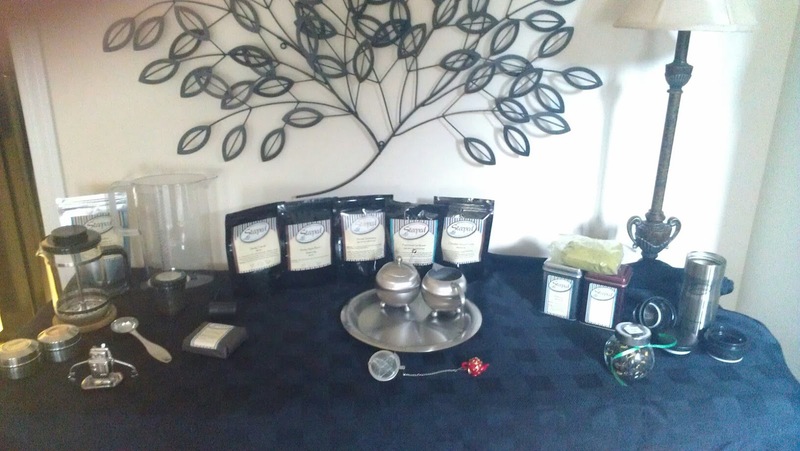 . .
And I'm becoming a Steeped Tea consultant myself! I had my "starter party" a couple weeks ago with the help of a more established consultant, and soon enough I'll be helping hosts with their own parties. I'm excited to share my love of tea with the world. Some of the sample items shown at the party. 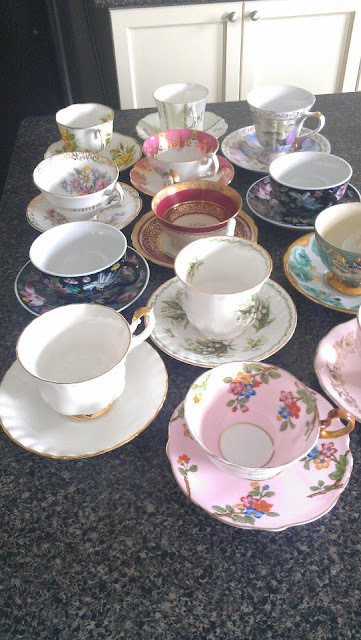 Item #14 on my 30 Before 30 list, Host a Steeped Tea Party, is more than complete.